As a part of our ongoing efforts in facilitating teaching and learning in mathematics, another activity has been conducted under the name of Mulle. This new initiative is carried out in collaboration with research colleagues from K2 Stockholm University who also where the hosts of this joint effort. 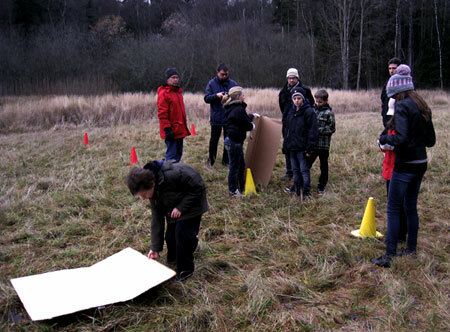 The students participating in this project came from “Rösjöskolan”, a local middle-school in Stockholm. The activity shared some common features and the technological platform used in previous efforts in the Geometry Mobile (GeM) project. However, there are some modifications that allow students to perform new measurements and calculations in the field. The students were encouraged to utilize both real world tools and digital mobile tools like GPS and a set of applications developed by CeLeKT to solve the different problems presented to them. The flow of the activity was also constructed to further involve all the participating students in the activity by further delegating responsibilities and sharing tasks between the members of the groups working in the field. The image below illustrates some of the activities carried out by children. Anna Wingkvist presented a long paper at mLearn 2009 that took place in the last week of October. Anna´s contribution (see reference below) has won the best PhD student paper award. Wingkvist, A., & Ericsson, M. (2009). Current Research Practices in Mobile Learning: A Survey. Proceedings of the 8th World Conference on Mobile and Contextual Learning (mLearn 2009) held on October 26-30, 2009 in Orlando, USA. Moreover, this paper has been invited for publication at the Journal of Computer Assisted Learning (JCAL). Congratulations to Anna for this excellent achievement. !http://w3.msi.vxu.se/~mmilrad/CeLeKT/Anna_09.jpg!